Here is a list of some of our duplicate titles we have for sale. 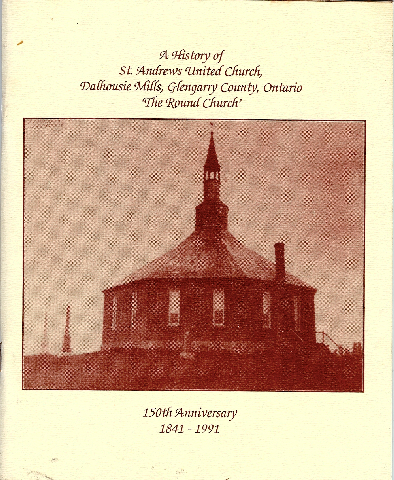 by D. W. McCuaig, 1984, SC, 40 pages illustrated. McCuaigs of Glenelg, The McCuaigs of Glengarry, Acknowledgements p.1; Our System p. 2; Peter McCuaig p. 3; Donald McCuaig p. 5; Duncan [D.D.] McCuaig, The McIntosh Family p. 6; D.D. 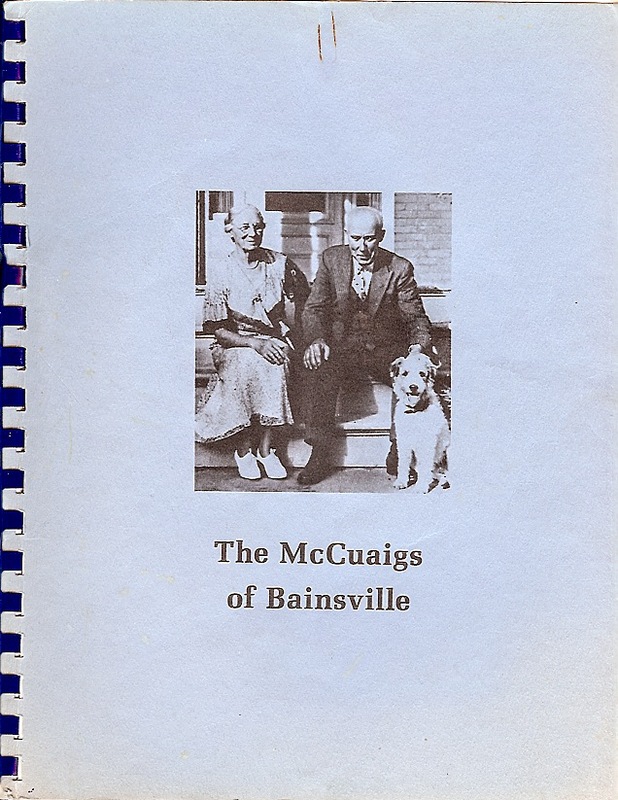 McCuaig, Stanley Howard McCuaig p. 8; Eric Alexander Duncan McCuaig, Ruth McCuaig Bates, Helen McCuaig McEvoy. Harwood S. McCuaig p. 12; Gertrude McCuaig Matheson p. 14 John Ross Matheson p. 17; Margaret Matheson Slemon, Dr. V. Carl McCuaig p. 18; Victor McCuaig, Natalie McCuaig May, Charles Homer McCuaig p. 20; Donald W. McCuaig [author], Margaret McCuaig Milliken, Lola McCuaig Guy, Edmund Barton McCuaig p. 22; Duncan Roderick McCuaig p. 23; Bainsville Memories, p. 28; The Sangster Family p. 36; Col. John McCuaig, more research. Bibliography p. 37 Remember When p. 38; Donald Wallace McCuaig petition p. 40. BY JOHN G. HARKNESS, 1951 reprint. 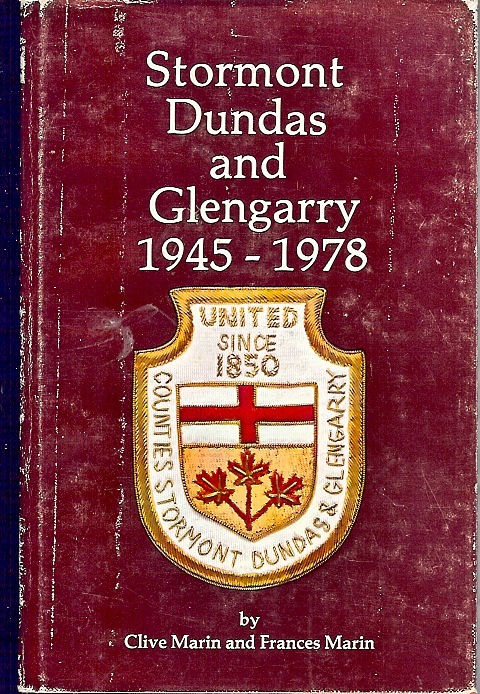 hardcover, illustrated, over 600 pages Deals with the History of the United counties or Stormont, Dundas and Glengarry. 1982, by Francis Marin, over 600 pages, ilustrated, This volume continues with the history of the counties from where the Harkness edition stops. Edited by Royce MacGillivray, 1991. We have a couple of copies, available as supplies last. 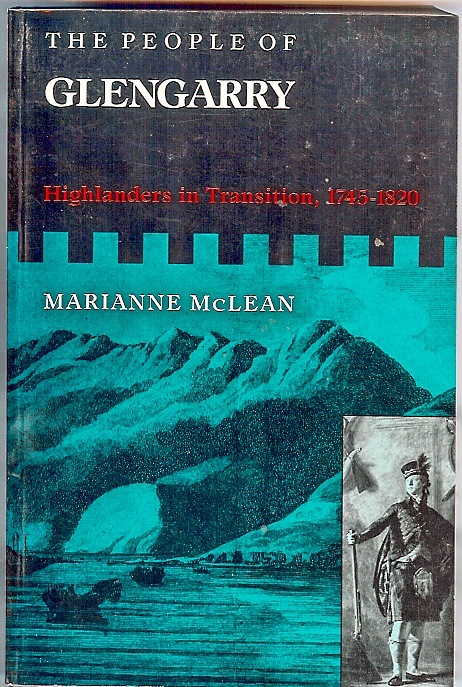 by Marianne McLean, hardcover with dust jacket, size 6 X 9, over 300 pages, ISBN 0-7735-0814-7 Series #9 of McGill-Queens Studies in Ethnic History. 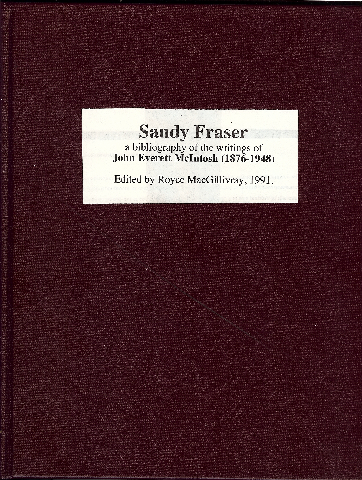 Contents include; Tables, maps p. ix, Preface p. xi, Illustrations following p. x111, Introduction p. 3, Western Inverness-shire after 1745 p. 14, Barisdale p. 24, Lochiel p. 42, Western Inverness-shire, 1770 - 1800 p. 62, The Loyalist Emigrants p. 78, The 1785 - 1793 Emigrants p. 98, The Peace of Amiens Emigrants p. 128, The Post 1815 Emigrants p. 151, Settlement 1784 - 1798 p. 168, Settlement 1797 - 1816 p. 188, Conclusion p. 205, Notes p. 218, Bibliography p. 266, Index p. 275. Beginning in the middle of the 18th century, the Highlands of Scotland underwent radical social and economic change. The economic transformation - from a quasi-feudal community to a society ordered by modern capitalist forces - led to declining status for clansmen and disruption of traditional social organization. With the PEOPLE OF GLENGARRY, McLean presents an examination of the cultural change which marked the historical experience of one group in Canada and begins to define the cultural legacy which their descendants share. 'A received view has been shattered so effectively in these pages that it is hard to see how anyone can ever put it together again. [McLean's book is ] one of the best Canadian immigration studies .... prepared up to this date. Drawing on an impressively wide range of sources (most of them unpublished) ... it definitely makes a significant original contribution to its field. It is likely to be a much consulted, much cited standard work.' Royce MacGillivray, Department of History, University of Waterloo. Marianne McLean is programme Head of the Public Life Archives Programme, Manuscript Division, Nation Archives of Canada. I have written this book most particularly for the people of Glengarry, whether in Scotland, in Canada, or elsewhere, for those whose lives are remembered here, and for all their families. 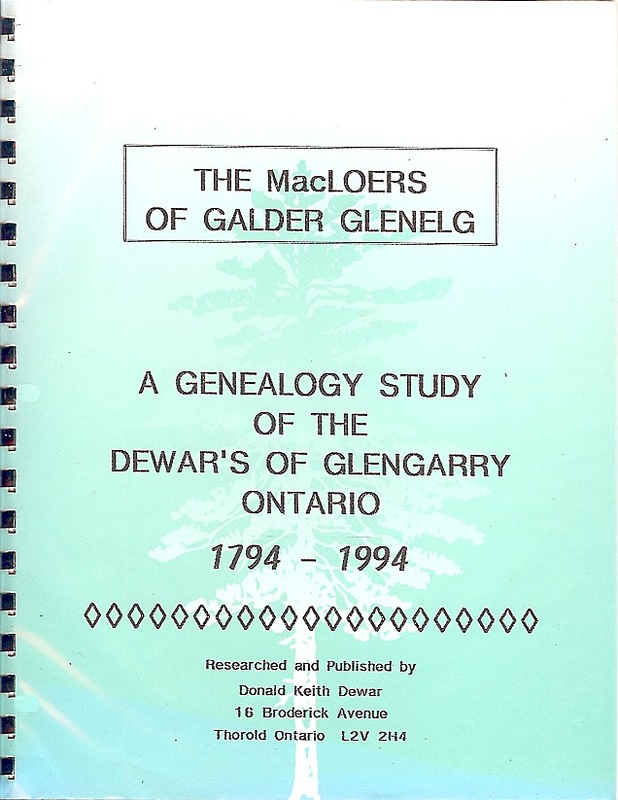 Cat.#3184/OLDG-184	The MacLoers of Galder Glenelg, A Genealogy Study of the Dewar's of Glengarry Ontario 1794 - 1994. Revised Feb.1996 by Donald Keith Dewar, softcover, cerlox bound, size 8.5 x 11, pages not numbered, about 55 pages, illustrated. The cover is the title page, no table of contents or index, no CIP or ISBN. The book is divided into the following headings; That Apple Hill Dance, April 23, 1923; What about those 3Dewars2 of Glenelg Scotland? ; And What about those 3Dewars2 in the County of Glengarry Ontario; The Death of Norman Dewar; How far back can we trace our ancestors from 3Galder Glenelg?2; The Dewars From Galder Glenelg; A Genealogical Study of the Dewar Family From Glenelg; John Bane Dewar - 1794; Angus Dewar - Blacksmith at Galder, of the Dewar family from Glenelg; Duncan [Donald] Dewar [Blacksmith] came to Canada in 1822, lived on Con 8 lot 14.5 West Hawkesbury; Roderick Dewar of Glenelg; Norman Dewar [Weaver] at Bernera; Dewars of Cote St. George Road, St. Telesphore - Seigniory Land, Quebec. The family of John Dewar and Christy MacDonald from Dull Perthshire Scotland; Dewars of Cote St. George Road, St. Telesphore - Seigniory Land, Quebec. The family of John Dewar and his wife Catherine McLennan; John Dewar, Lot 35 - Con. 4 Lochiel; Archibald Dewar, lot 1 - Con 4 - Roxborough Township [Baptist]. Keith Dewar died a number of years ago. 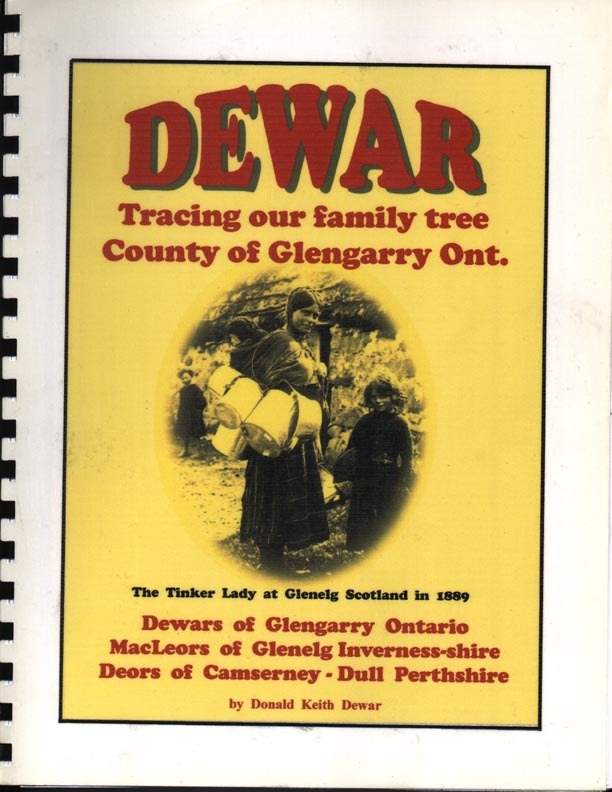 More info on this work go to " Dewar,-- Tracing Our Family Tree, County of Glengarry Ont. " Alasdair Macrae has all of the DEWAR research now, he is continuing on the research and the book. Alasdair may be reached by e mail at ali.ruadh @ btinternet.com This e mail for Alasdair McRae may or may no longer be valid. This is the only contact info I have for this Dewar work. 1994, editor Rae Fleming, S.C., 8 x 10, CIP, ISBN 0-920474-96-9, about 200 pages, illustrated, 1802 passenger list, some family tree charts. book sponsored by Hugh P. MacMillan. For Anyone interested in the history of the Scottish people, in Scotland and North America, this book is essential reading. 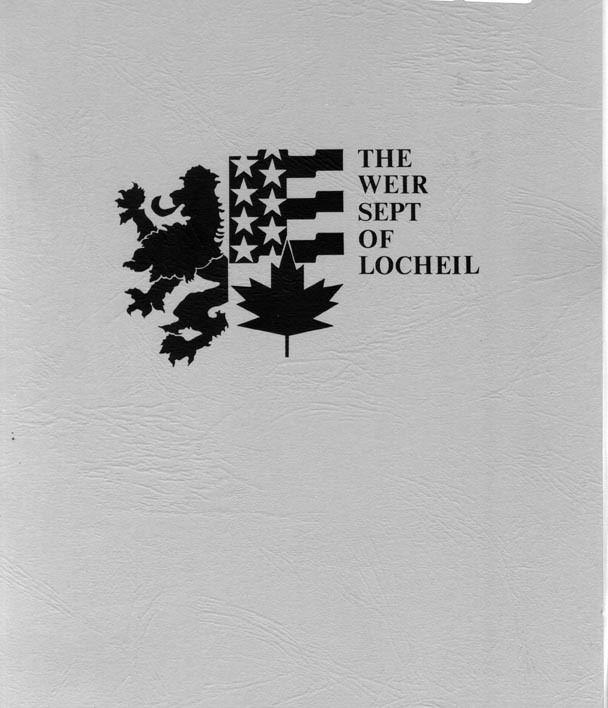 In Canada and the United States today there are tens of thousands of descendants of Highland Scots who left Lochaber around 1800 to settle in Glengarry County. This book deals with the conditions in Scotland before migration, settlement experiences in Glengarry, and the spread of these Scots-Canadians from Glengarry to the American and Canadian West. There are fur trade and Metis Connections, and even ties with the Caribbean. As well as colourful articles, this book contains a wealth of genealogical information, family trees, maps, photographs and other illustrations. Did Your ancestor come to Canada in 1802, with Allan McMillan [1752-1823] of Glenpean, Loch Arkaig, Scotland. 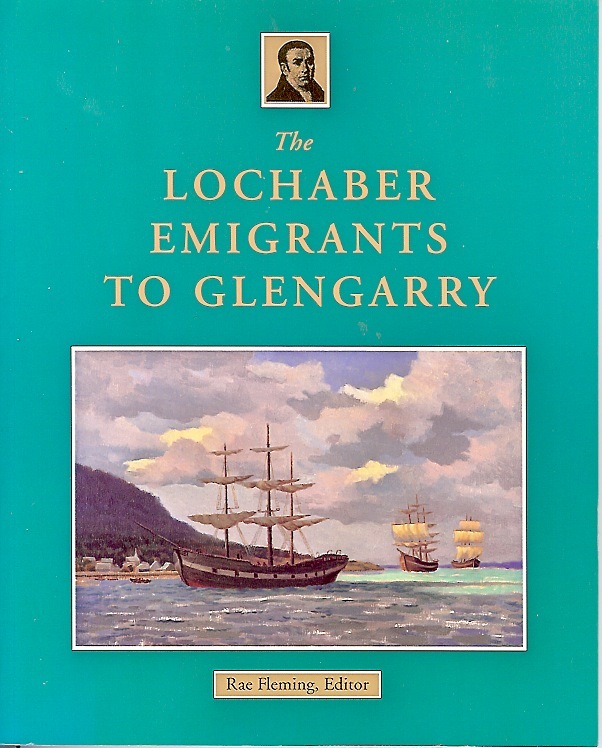 In 1802 with his cousin Archibald McMillan [1762-1832] Allan brought three shiploads of emigrants to Glengarry County Canada. This book will interest Scottish history "Buffs" as well as descendants of MacMillans [ or Macmillans, or McMillans, or MacMillans] and the 47 other clan names on the ship1s list. These descendants are scattered all over North America. Other clan names were; Beaton, Cameron, Campbell, Chisholm, Corbett, Dewar, Fletcher, Forbes, Fraser, Gandie, Grant, Gunn, Henderson, Kennedy, MacArthur, MacCormick, MacCosham, MacCrimmon, McCuaig, McCullough, McDonald, MacDonnell, McDougall, MacGillis, McGillivray, MacIntosh, McKay. McKenzie, McKinnon, McLachlane, MacLean, McLennan, MacMaster, MacPhee, MacPherson, MacQueen, MacRae, Marshall, Morrison, Neven, Rankin, Robertson, Scott, Stewart, Wadell, Wright. This battle cry has echoed across many of the toughest battlefields where Canadian troops have fought. Highlanders from three proud counties and surrounding areas have served for more than a hundred years. They still serve. Standing ready in peacetime, or answering the call to war, the Regiment and its members have never been found wanting. True as that is, this book is not simply a war story. As General Crerar said in his Foreword to the first edition of the story of the Highlanders, "This is more than a regimental history. It is also a story ... of families who settled, and animated, the Counties ..."
The Canadian Militia unit known as The Glens; whose official name is Stormont, Dundas and Glengarry Highlanders, can trace its roots as a proud and valiant military organization to the earliest days of settlement of the parts of Upper Canada now known as Eastern Ontario. Most of the men who were its first members came to what was then Upper Canada from the United States where they served in either the 84th Royal Highland Emigrant Regiment or the King's Royal Regiment of New York. They fought on the losing side in the American Revolutionary War and they were offered the opportunity of a new life in a new land. Canada welcomed them, and they made their homes here. The book is rich with tales of the exploits of some of the most colourful and heroic individuals that Canada, or any other nation, has ever seen. Perhaps first among these was Colonel "Red George" Macdonell, the conqueror of Ogdensburg and one of the commanders of the victors at Chategueay in the War of 1812. To participate in that battle he covered 140 miles by water and 40 by land in four and a half days at the head of the battalion he commanded. In the same time, there was very much in evidence Red George's kinsman, The Warrior Bishop. Among other patriotic feats, he excommunicated a would-be deserter on the frozen river, as the troops marched to the attack under fire of the fort's cannons. There was Sergeart Nunney, a ferocious fighter in World War I, awarded three of the highest decorations a soldier can win. No reader of the book could ever forget "Uniformity". the dog who travelled everywhere with The Glens, nearly sailed to Europe, and who left her descendants all over Eastern Ontario. The greatest strength of this monumental work is the incredible wealth of accurate and detailed information that is contains. 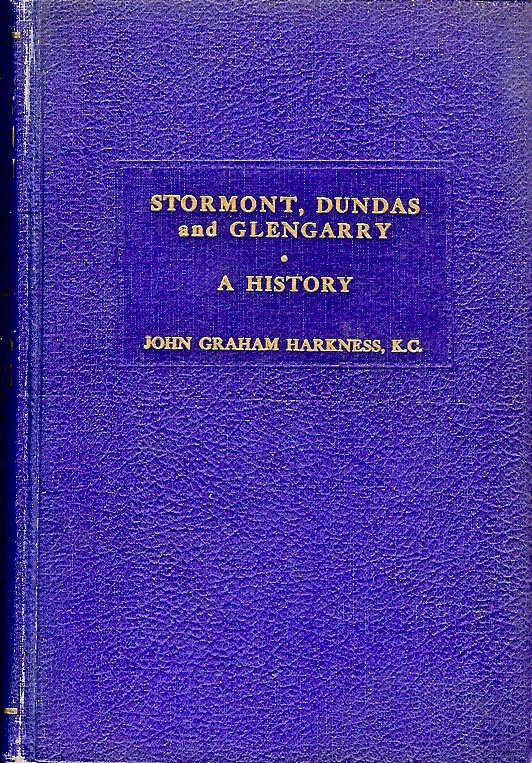 From the first pages where Lieutenant-Colonel Boss describes the earliest settlers of the United Counties, through the War of 1812, the Rebellion and the Fenian Raids, South Africa, World War I, England, Normandy, Holland and Germany, his tales of The Glens at peace and war are detailed and often awe-inspiring. General Patterson brings the history up to date with his summary of the forty-three years since the book was first published. He reports on The Glens' involvement in tasks as diverse as the October Crisis of 1970 and UN Peacekeeping in places such as Cyprus, Yugoslavia and the Gaza strip. Through it all, the facts (and the human tales) are there. 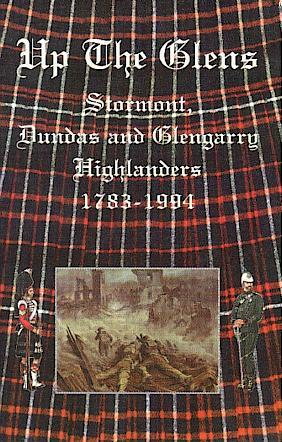 The book contains thirty-two pages of photographs and maps, showing The Glens at peace and at war. Forty appendices provide hard-to-find details of the men and women who served, and those who are still serving; their contributions, sacrifices, honours and awards. published July 1995, by THE OLD BOOK STORE, Cornwall, Ontario coffee table format, size 9 X 12, HC with Glengarry Tartan dust jacket in colour , illustrated with over 30 pages of photos, easy reading type, 300 pages, updated to 1994 by Brigadier General W. J. Patterson and is the complete reprint of the Stormont, Dundas and Glengarry Highlanders, 1783 - 1951, by William Boss, 1st edition published 1952. This work has 20 chapters and 40 Appendiecs. See also the above outline.